The 2014, 2015, and 2016 classes of AOSIS Fellows supporting AOSIS at COP22 in Marrakech. The Fellowship Alumni Network connects all classes of AOSIS Fellows working on climate change and sustainable development issues at the United Nations and around the globe. In her role as Counselor, Isabel is in charge of Sustainable Development and Climate Change issues for the Cabo Verde mission. In addition, she is part of an inter-ministerial team working on climate change. As the officer responsible for the UNFCCC under this project, Ilisapeci works closely with the Climate Change Division and other relevant stakeholders to identify and address capacity constraints, gaps and challenges they encounter when implementing Fiji’s commitments to the UNFCCC. George currently serves as the AOSIS thematic coordinator on technology at the UNFCCC. In his role at the Seychelles Meteorological Authority, George conducts observations of the weather parameters in accordance to the rules of the International Civil Aviation Organization and the World Meteorological Organization. George also assists in the analyzing meteorological observational data in support of climate change detection, prediction and its economic impacts on Seychelles. He also advises on the adaptation measures to be undertaken to minimize the impacts. Ismail currently works for the Maldives Mission in New York, in its capacity as the Chair of the AOSIS. He is the lead negotiator on issues relating to Oceans and Seas at the UN, and is the coordinator for Transparency in the Climate Change negotiations at the UNFCCC. He specializes on issues concerning Small Island Developing States broadly across the UN system. Isis is a speechwriter in the Office of the President of the General Assembly. She also advises on youth, communications and reforms. Isis uses her climate change training on the job and works regularly with the climate and development team. In her role as the Principal Vulnerability and Adaptation Officer, Losana plans and manages the operations and staff of Vulnerability & Adaptation Section. Her main responsibility is to provide technical and advisory support to the Head of the Department including on past, current, and future vulnerability assessments and adaptation to climate change in Tonga, drafting and finalizing of Adaptation Strategies, conducting assessment and research in Tonga, drafting project concepts and proposals, and monitoring the climate change program and project activities. 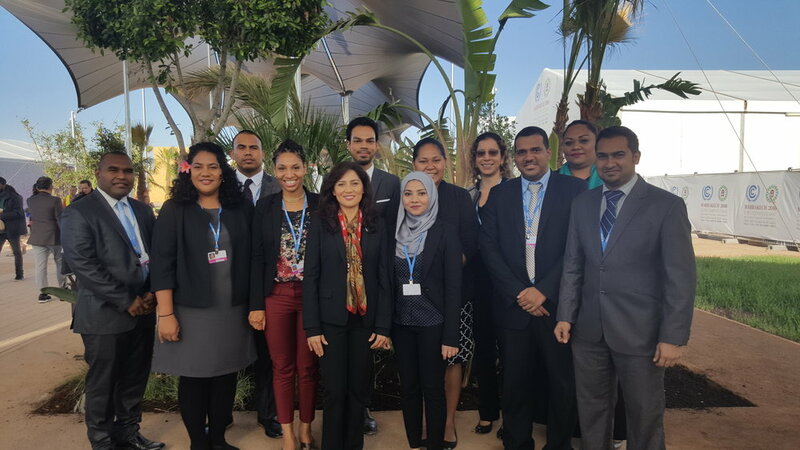 Losana continues to represent Tonga at UNFCCC negotiations, focusing on adaptation. In his role as Environment Officer/Senior Environment Officer, Shanawaz ensures compliance, from industrialists and the public in general, to environmental legislations and standards under the Environment Protection Act (EPA) 2002. He addresses environmental complaints and attends to environmental emergencies by taking appropriate actions as set out through established protocols. He also provides advice to industrialists and public in general on appropriate pollution abatement measures, cleaner production techniques and on other environmental issues. Under the Environment Protection (Industrial Waste Audit) Regulations 2008, Shanawaz triggers industries to play an active role in monitoring their environmental impacts as well as development of a culture of self-compliance. As part of his duties, Shanawaz promotes the adaptation and mitigation capacities of the industrial communities to climate change and natural disasters, in a view to adopt more sustainable initiatives for a pollution-free and more climate resilient island. Moreover, he also provides technical input into the formation and review of environmental policies, legislation, regulations and guidelines including Climate Change and Integrated Coastal Zone Management. In his role as the Chief Climate Change Adaptation Officer, Thaddeus collaborates on vulnerability and risk assessment studies, provides guidance on the dissemination of climate change information, and assisted in drafting the Solomon Islands climate change bill. In addition, he works with communities and partners on the development and implementation of adaptation projects. Thaddeus continues to represent the Solomon Islands at the UNFCCC and assists colleagues in understanding the UNFCCC process. Attaché, Climate Change advisor, Permanent mission of Comoros to the United Nations. Saand is an Engineer in Energy and Environment from the University of Technology of Belfort Montbeliard, France. In 2015 he started working as a junior consultant in renewable energy for Comoros Negotiators and Diplomats. Despite his specialization in renewable energy, Saand decided to following the Climate Finance track at the UNFCCC negotiations. He is now pursuing his career helping his country in areas related to Climate Change and Energy as a Climate Change Advisor at the Permanent Mission of the Union of Comoros to the United Nations.